Discount Diva: Is it too cold for a town center at Eastern Hills Mall? The number one criticism people throw at the plan to bulldoze Eastern Hills Mall and replace it with a town center is this: It won't work here because it's too cold. Unlike an enclosed shopping mall, where corridors are heated and shoppers are sheltered from the elements, town centers are open-air communities. So, Clarence – with its long, cold and snowy winters – is just too darn cold to make a town center work. If similar projects elsewhere are any indication, the answer is no. A town center is not a mall. Though town centers feature retail, store leases are supported by rent from apartments, entertainment venues, restaurants, fitness centers and offices. Town centers are a response to the retail apocalypse. Landlords and developers, realizing that large-scale, retail-only projects are no longer sustainable, are bringing in a stronger mix of uses to keep properties viable. People hear "town center" and think "open-air shopping". That's not what it is. Town centers are small, self-sustaining, urban-inspired communities. Retail is integrated among high-end residential and class-A office space. Apartments and offices are stacked on top of retail spaces, the way they are on Elmwood Avenue. Saying a town center can't exist here because it's too cold is like saying the Elmwood Village can't exist here because it's too cold. Designers have tricks to warm things up. Gensler, the architecture design firm handling the Eastern Hills project, has been visiting winter resorts looking for ways to turn Clarence's winters into an asset rather than a stumbling block. In Colorado, they found that adding gentle slopes and building in elevation changes can add visual interest and, more importantly, help block the wind. Standing-height fire pits were functional, but added other benefits, too. "It provided something beautiful to look at and became an impromptu gather place for patrons," said Marc Bruffett, a principal at Gensler. "We saw people from different families coming together, warming their hands, talking and meeting each other." It's not just about warming up the space, either. Gensler is studying a slew of four-season activities to draw people in. Other town centers are known for their Christmas activities, winter parades and tree lighting ceremonies. Some of the most successful town centers are in cold or snowy climates. Eastern Hills has pointed to the Crocker Park town center as a model for what it aims to accomplish, partially because Crocker Park is located in a similar climate and among similar demographics. 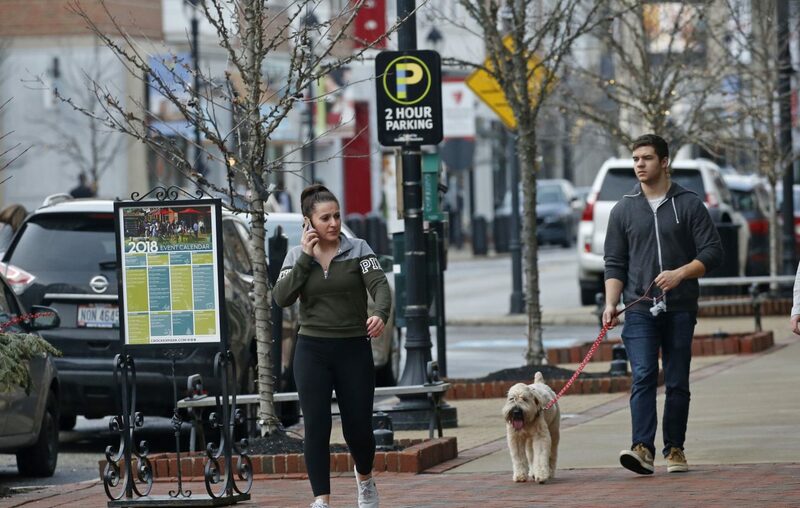 Crocker Park is about 15 miles outside Cleveland in Westlake Ohio, which had an average low temperature of 19 degrees in January, according to the National Oceanic and Atmospheric Administration. The Easton town center in Columbus, Ohio, is further south, but still gets its fair share of snow and cold. It averaged a 20-degree low for the month of January. The Shops at Nanuet is located near the Hudson River and had an average low of 18 degrees in January.